I left early this morning for Los Angeles. I don’t necessarily like to fly out so early, but the ticket was much cheaper that way, so I did it. Since I arrived in LA at 8 AM, and I didn’t need to be in Bakersfield until this evening I took advantage of it and spent some time at Santa Monica Beach. I love the beach. When I see the vastness of the ocean it reminds me of how big and awesome our God is! 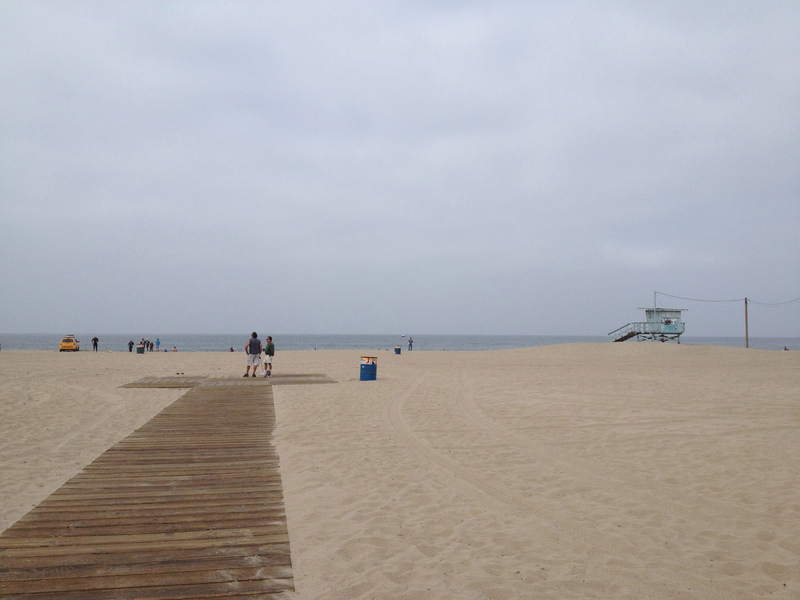 I was struck by something else as I walked from Santa Monica Beach to Venice Beach. All the people! All the needy people! There is a mixture of those who are exercising, relaxing, bumming and making a living. I encountered some odd and interesting characters. 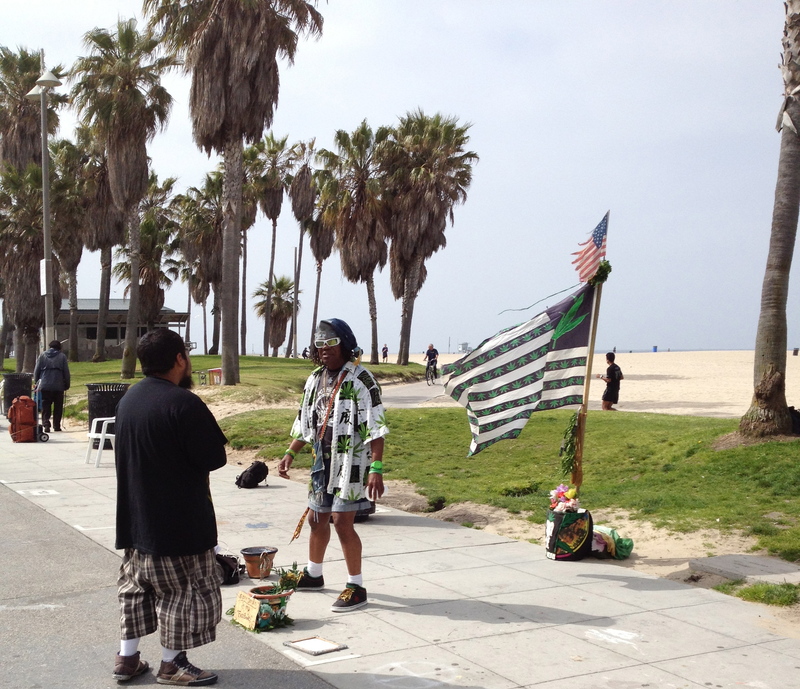 One guy had a big flag with a marijuana plant on it. I took a picture of him. I thought, “this is California at it’s finest,” or at least I thought it was funny. The guy didn’t like me taking a picture so he gave me a not so nice gesture. In every culture there are small ‘g’ gods. Things people make an idol out of. I did see some literal idols, and paintings of spiritual beings. These are indeed spiritual people. For some their idol is their body, or maybe their health. It’s sad, but we all struggle with making idols out of even good things. Someone has said that our hearts are idol factories! While I was at the beach I took a break and went over my sermon notes, and the last part of this passage really hit me. As Jesus was among the people he saw their crying need. He saw they were harassed and helpless. Not only were they a needy people, but they didn’t have anyone to care for them. They were like helpless, hapless sheep without a shepherd. I thought, “wow! That’s a pretty good description of what I’m seeing here. Many people in need.” If we want to have the compassion Jesus had, we just need to open our eyes. Look at those around you. I’m sure you will find many who are distressed. Jesus felt deeply for the people. He proclaimed the good news of the gospel of the kingdom. This makes me ask, is the gospel we are proclaiming good news? Gospel means good news, but do those we share it with feel like it’s good news? Are we distorting the good news? I sure do hope and pray that as I’m sharing the gospel, that it is truly good news to those that receive it. Then Jesus asks his disciples to pray for workers to be thrust out into the harvest field. The needs are so great, and the workers are so few! This is one more reason we need your prayers. One more reason we need workers. O Lord, hear our prayer and send workers to labor with us on the border, and beyond! What is your response to the questions I am asking here? I have felt this need that you saw and felt on the beach. At one time, He had me walking and praying throughout the town I live in. Praying for you as you bring His message tomorrow! It sounds like you are so tuned in with God…his spirit has opened your eyes to all that is around you….that is so awesome! I remember how it was when we lived there…..I agree, we must pray for this overwhelming need we are surrounded by….. I do pray that I will listen to the Lord, and that He will guide and direct me! Thanks for sharing at Covenant Pres. in Bako. Enjoy your sermon. I want that same compassion for the lost. Thanks for the encouragement – I loved being at the church and meeting you. I pray for God’s powerful work in all of our hearts as we seek Him. You have an obvious heart for people. It should be a requirement for ministry! The Lord has worked in my heart over the years. I still struggle with being stubborn and not listening to the Spirit like I should, but I do pray the Lord will use me even in my weakness! I see the in-dwelling Spirit reflected in you posts. We definitely need the Spirit to be at work – I pray that the Spirit will be poured out on the border!